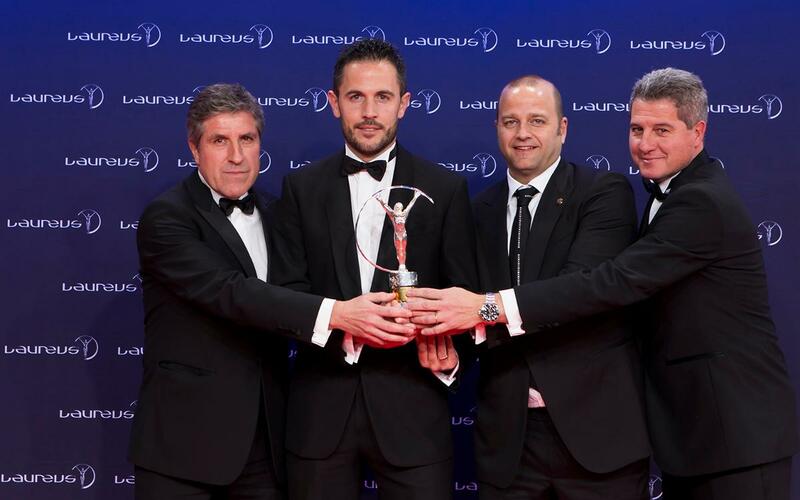 The Laureus Award for the Best Sporting Moment of the Year, won by the FC Barcelona ‘Infantil B’ team and collected on Tuesday evening by Sergi Milà at the gala in Monaco is the third Laureus Award that the club has won. The latest of these prestigious sporting accolades to be headed for the Camp Nou is the one won by the youth football team for their consoling gestures towards the beaten opposition at last summer’s World Challenge Cup in Japan. The club was also honoured in 2007 and 2012. In the former case, FC Barcelona won the Spirit of Sport category in recognition of its historic agreement with UNICEF, which is into its tenth year now. And in 2011, Barça was named Team of the Year after winning La Liga, the Champions League, the Spanish Super Cup, the European Super Cup and the Club World Cup. Sergi Milà, coach of the Infantil B team, collected the trophy from former Barça captain Carles Puyol, commenting that the award “is to do with values, respect and fair play.” Milà was joined in Monaco by Xavier Vilajoana, the director of amateur youth football; Jordi Roura, technical secretary for youth amateur football, and Aureli Altimira, coordinator of youth amateur football. After the gala, both Roura and Altimira stressed how important respect for the opposition is among all teams in the Barça youth system. 2007 Laureus Award for Spirit of Sport for the agreement with UNICEF. 2012 Laureus Award for Best Team in the World in 2011. 2017 Laureus Award for Best Sporting Moment of the Year in 2017.